Notes: Minimum 3 persons per group for SUP school and 2 persons per group for SUP lesson are required. We are flexible and the exact time can be arranged with you. However, we usually have better weather conditions for the SUP school in the morning than in the afternoon - there is very often a north-west wind after 2:00 PM. Vessels similar to stand up paddle (SUP) boards were used by the south American and African people as early as centuries ago to hunt, fish or travel. As early as in the 1940s, people in Hawaii started to use the paddle when riding the waves. As manufacturers introduced SUP boards into the market two decades ago, SUP spread worldwide in a very short time and people also started to paddle on flat water like lakes and rivers. A decade ago, inflatable SUPs were introduced, increasing the mobility of this sport and bringing about a further revolution where SUP became one of the fastest growing sports worldwide. In mid-2016 South African Chris Bertish crossed even the Atlantic Ocean solo on a SUP in just 93 days. Stand up paddling is a very easy sport to learn and it is suitable for all ages. Our instructors can help you make the first steps on the SUP and you can start to enjoy SUP in a very short time. We have an excellent location for SUP beginners because we are situated in a bay and protected from the wind and waves. Besides that, we also use suitable SUP boards with large buoyancy that are stable enough for any beginner to feel comfortable even when using it for the first time. 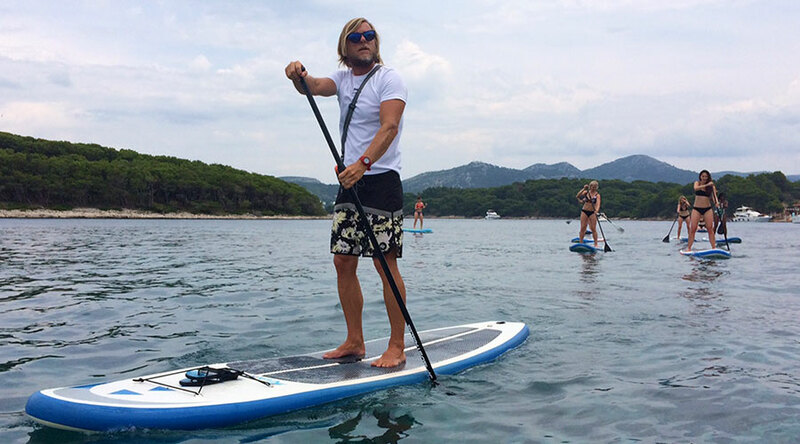 At stand up paddle school you will first be given a short introduction to SUP on land (15 – 20 minutes). The instructor will explain to you how to stand on the board, how to keep balance, how to paddle and how to turn the board quickly and will give you some advice regarding safety. We’ll also give you some information about local winds and currents and advise you on how to avoid possible but unwanted situations. You will take your first steps and gain initial practice with the instructor in our protected bay on the sea. The instructor will stay close to the group at all times, helping in all situations and giving the necessary advice on how to correct mistakes and improve your paddling techniques. When you master the basics of paddling on a SUP, which may take 1 hour or less, depending on the group, your instructor will take you out for the first beginner tour. The distance and route of the tour may vary depending on the group skill level, their preferences and weather conditions. You will have the opportunity to visit beautiful nearby cliffs or to paddle across the channel to the Pakleni Islands. You may use the third hour to practice on the SUP alone or to extend the tour with your instructor. If needed, we’ll also provide you with a life jacket and dry bag (included in the price). Introduction to SUP and basic techniques (20 min), practice in our bay with instructor (30 – 60 min), SUP tour with instructor (1 – 2 h). In case you don’t have time to perform the whole SUP school package (3 hours) in one day, there is possibility to spread this activity out into more days. Introduction to SUP and basic techniques (20 min), practice in our bay with instructor (40 min). Note: Depending on the weather conditions and group preferences the exact course of SUP school or SUP lessons may vary. Book your SUP school at least 2 days in advance and get 10% discount. Get additonal 10% discount on group bookings (4 persons or more).